Are you looking for the perfect way to relax after a long day’s work? An inflatable hot tub responds perfectly to any stressful day. Warm water and massaging bubbles wait to soothe any bodily aches and pains. Meanwhile, that same spa will host the perfect gathering amongst family and friends. So, what is not to love about an inflatable hot tub? When buying one, you might realize a small problem—so many of these spas exist on the market. How will you ever know which is right for you? We are here to help! We tested the ten best inflatable hot tubs in the UK. Along the way, we noted our favourite features of each. Thus, all you need is to read along with us. Find out which spa offers everything you need for your hot tub experience. 4 Which Inflatable Hot Tub is Best? What Do You Have To Buy Extra For An Inflatable Hot Tub? What Chemicals Should I Use In My Inflatable Hot Tub? Before we jump into the spas themselves, we listed some features you will want to note. Each of these features will add some clarity to your decision when considering budget, size, and extra work involved with an inflatable hot tub. If you buy a hot tub, you obviously want heated water. So heater acts as a vital feature to any spa. The heater determines how quickly your water heats. Most models will heat at a rate of 1.5-3 degrees C/ hr. Other factors such as outside weather and water temperature will impact the speed at which your water heats. In an England summer, expect your hot tub to heat in 6-12 hours. A heater’s energy is measured in Watts. Keep in mind that higher watts can heat your water faster. But these watts will consume more energy as well. This means you will spend more money to use your hot tub. Of course, you will also want a heater that can maintain heat. Most of these spas do a great job of keeping your spa heated. Keep in mind that lids, covers, and cushioned mats keep your spa insulated. These features are great for when your heater is not in use. If you want to save some money, many spas offer energy efficient heaters. But we will discuss these later. The jets will add an extra sense of relaxation to your spa. Your spa’s jets will impact your overall experience. Most inflatable hot tubs offer these as a default option. They create a stream of air bubbles from the perimeter of your spa’s floor. These create a gentle massage feel. You will usually need to spend some extra money for these. But you might feel they are worth the added cost if you prefer a more powerful massage. You will find the hydrojets built into the sides of your spa’s walls. You have full control over the power and direction of the jets. So, if you want a more customizable experience, hydrojets might be the choice for you. Of course, you are not limited to one choice here. You can get the best of both worlds. Airjets will blow bubbles from the floor. Meanwhile, the hydrojets massage your body from the walls. When it comes to the power of your pumps and jets, the number is measured in HP. Note that American HP is different from UK HP. 6 HP in the US measures to 1-1.5 HP in the UK. Keep in mind that a 1-2 HP pump is all you will usually need to power your hot tub jets. As a rule of thumb, if you feel water pressure emitting from the jets, your pump has enough HP. Lastly, remember to check the number of jets in your spa. You cannot always accept the value written by the manufacturer. For example, sometimes, a spa will list it presents 8 jets. However, in some cases, this simply means 8 jet heads with two large jets rotating behind the outlets. Also, note that a large amount of small jets will often produce less pressure than a small number of large jets. Seating capacity acts as an important feature. Thus, consider how you will use your spa before buying. Is this hot tub for a couple? If so, you will find most 2-4 capacity spas will fit your needs. But if you plan to buy this hot tub for your entire family or gathering events, consider larger options. Larger models will comfortably fit six people. Note that inflatable hot tubs offer smaller capacities than fixed spas. Also, you will want to look for raised seats if you plan to allow children in your hot tub. You will find your spa’s water capacity measured in gallons and litres. Most will range from 550 L to 1173 L. The water capacity determines how much water your pool holds. So, larger capacities require more time to fill. Also, note that capacity determines the depth of the water. Plan accordingly if children or shorter guests will use your spa. You will find this measured in litres/ hour. The number determines how quickly the water will enter your spa. 1741 litres/ hour tends to be the typical flow rate of the average inflatable spa. Keep in mind that most inflatable spas are easy to setup. Airjet models will usually come with air blowers. Meanwhile, hydrojet models come with electric air pumps. Using these tools is no difficult task. Most spas also come with setup DVDs if you ever feel lost reading the instructions. After inflating the spa, you simply fill the hot tub with water. Some spas will come with hard water to soft water filters. Soft water is great for sensitive skin. The water will flow into your skin with a much more gentle feel. And yes, after using hard and soft water, you will feel a difference. This is not a feature solely for your skin. Hard water can damage your filter. Build up of hard water will reduce the flow rate of your spa. This can result in a reduced lifespan of the hot tub as well. 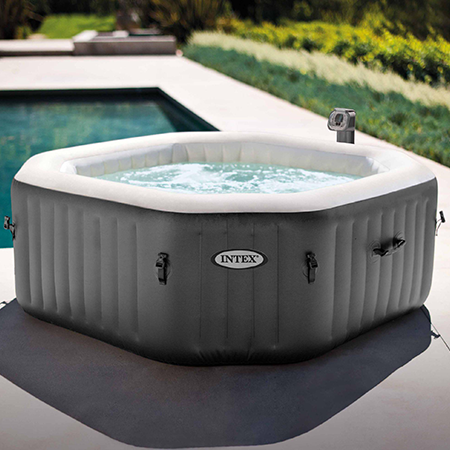 Most inflatable hot tubs require filter cartridges and chemicals to keep the water clean. Also, if you see cloudy water after chemical treatments, you will need to perform a water change. Do not worry; disinfecting chemicals are safe for you and your spa. Although filter cartridges are a cheaper option that constantly purchasing chemicals. We all like saving money, right? Keep in mind that your electric bill will rise after using an inflatable hot tub. The amount depends on a number of variables. For example, the watts produced by your heater will impact your electric bill. Yet you will need the high wattage for heating larger spas. Some hot tubs come with timers to prevent this issue. These power off your heaters when not in use. You will also save money by ensuring the heat remains in the water. Insulating lids, mats, and covers will help with this. Of course, you will want a nice warranty if your pool ever malfunctions. Do not only worry about the length of the warranty. Also, keep track of the places you can buy parts and repairs. Often, you will not need to replace your entire spa. Sometimes you will only need to buy a cheap part. Here’s the part we have all been waiting for—the reviews! We found the following to act as the 10 best inflatable hot tubs in the UK. Pay close attention to the features you want. At the end of the day, these all work as great spas. Thus, you will need to decide which works best for your lifestyle. 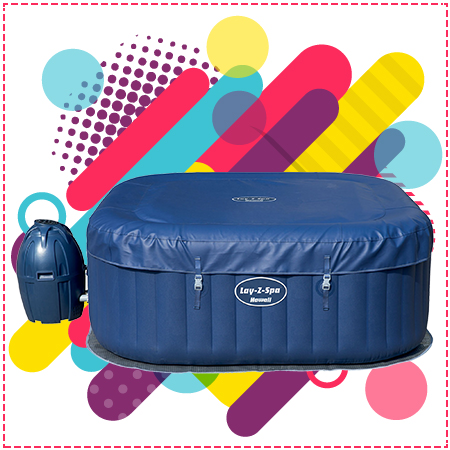 Are you looking for one of the largest inflatable spas on the market? Lay-Z-Spa offers just that with its St. Moritz model. But does this spa offer the features to keep up with others on our list? Read along to learn more. As we already mentioned, this spa is huge. The St. Moritz’s exact dimensions measure 216 cm x 216 cm x 71 cm. You will also fit 1190 L of water in the hot tub. So, this will take quite a bit of space upon placement. But note that Lay-Z-Spas work when placed indoors or outdoors. So you have some flexibility regarding the spa’s placement. Also, considering you will fit 5-7 people in this spa, the space works as more of a benefit. Even for smaller families and couples, this hot tub provides plenty of relaxing space. As with most inflatable hot tubs, the heater reaches 40 degrees Celsius. A soft touch control panel allows you to adjust this temperature to your comfort zone. Unfortunately, all Lay-Z-Spa control units are not waterproof. Instead, these are splash proof. Thus, you will want to buy a gazebo to protect this panel. Even better, this spa comes with an energy saving timer. This is great news for your electric bill. The heater powers off when not in use. You can also set a timer for full heat at a specific time. So, you can jump in your spa the instant you arrive home from a long day’s work. Unfortunately, the rapid heating system does not fit its name. Even with the 2050W heater, we waited an entire 12 hours for this spa to fully heat after setup. Some of the time is expected with a larger pool. But 12 hours still feels like a lengthy wait time. So, do not expect to jump in your hot tub the day you receive it. Are you looking for a durable hot tub? If you answer yes, then look no further than the St. Moritz. The Rattan Printed Premium Tritech material from Lay-Z-Spa truly behaves like a fixed hot tub. The spa’s walls consist of the 3-ply reinforced Tritech material. This allows you to lean against walls without fear of them flexing or bending. The hot tub feels like a stable structure all-around. The spa also comes with a padded floor and thermal insulation mat for retaining heat and extra durability. Even better, the leatheroid cover provides scratch and puncture resistance. This means branches, twigs, cats, and other objects common in houses and yards will not damage this spa. Even better, the cover comes with a lock and safety clips. This keeps children out of the spa when not in use. You will also not need to worry about the wind blowing the cover off your hot tub. If you are worried about the heating times of this pool, the St. Moritz also comes with a durable inflatable lid. This will insulate your tub, ensuring no excessive heat is ever lost. If you want a decent massage experience, then check out the 140 air jets. These surround the perimeter of your spa’s floor. With so many, you will receive a massage experience few other airjet systems apply. 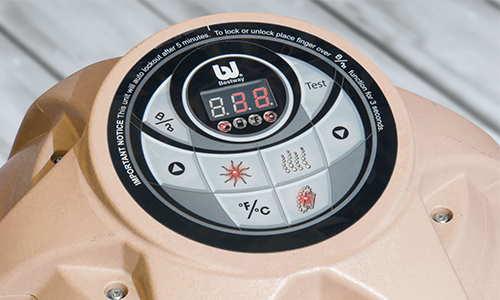 To control the airjets, the inflatable hot tub comes with a soft touch control panel. This piece offers all the basics a spa will need. This included temperature control, bubble control, lock features, and a toggle between Celsius and Fahrenheit. Nothing about the panel feels too complicated. Thus no one should find any problems fixing their spa to their likings. You will find a digital heater and integrated water filtration and airjet system. Also, you will find the leatheroid exterior inflatable tub with a soft cushioned mat, the leatheroid top cover, and an inflatable lid. For cleaning your spa, you will receive two Bestway Lay-Z-Spa filter cartridges and one Bestway Lay-Z-Spa chemical floater. To make for a better experience, you will receive a protective ground sheet, repair patches, and a setup DVD. HUGE—this will host small gatherings well. Sturdy—the walls really feel like a fixed hot tub without any flexing. Handles on sides allow for easy moving. Water takes a while to heat—up to 12 hours in our tests. When it comes to large spas, the St. Moritz offers one of the best experiences. If you can wait the first 12 hours for your water to heat, then you will love this hot tub. Little works greater for hosting gatherings with family and friends. Do you want that extra sense of luxury from your inflatable hot tub? Lay-Z-Spa’s Palm Springs hydrojet model will give you the massage experience of a fixed hot tub. The spa also comes with some nice filtration features, making this one of the best inflatable hot tubs on the market. The Lay-Z-Spa Palm Springs works great if you want a moderate sized hot tub. At 196cm x 196cm x 71cm this spa will fit nicely into most patios and homes. Yet the size offers enough space to comfortably fit between 4-6 people. So, invite your family and friends for a nice gathering. You’ll find the Palm Springs’s water capacity to be lower than other spas on our list. At 795 L, the water will sit lower than the typical inflatable hot tub. However, this is not a full bad thing. Shorter people and children will fit nicely in this spa with the lower water level. If you’re looking for the ultimate massage experience, look no further than this spa’s hydrojets. All 8 of these jets sit along the walls of your hot tub. Each provides adjustable and directional heads. This allows you to always target those achy muscles. Even without aches and pains, these hydrojets provide a soothing and relaxing feel. As with other spas on our list, you can reach 40 degrees Celsius with this heater. Of course, you can always alter the temperature with the control panel as well. Much like other Lay-Z-Spa’s, this hot tub comes with an energy saving timer. So, you can shut off your heater when not in use. You can also time the heater to power on at specific times. This is great if you plan to host a party at a certain time or just want to relax after work. Your spa powers on the heater to reach a desired temperature by those times. As far as heating the water, we noticed this spa took about nine hours. This time is not great by any means. Yet we have also seen far worse on other spas. Thus, the heating time works well enough. When it comes to insulation, the Palm Springs model covers all your needs. You will find a cover and inflatable lid to trap the warm water inside the spa. Even better, you can clip the lid to the spa to ensure the wind and elements to not remove this top. You will also find a ground mat to keep your heat insulated in the bottom of the spa. Do you want a durable spa? If you answer yes, then the tri-tech material will fill your needs. You can lean along these walls without worrying about the tub bending or flexing. Twigs and branches also failed to damage this spa during our tests. Much like other spas on our list, you will find no problems setting up the Palm Springs. The hot tub self-inflates with a spa pump. You will need to bring no outside tools. In our tests, we inflated the spa in 10 minutes. If you need any extra help, a free DVD clarifies everything. This spa also offers a quick drain system. Why is this a nice feature? 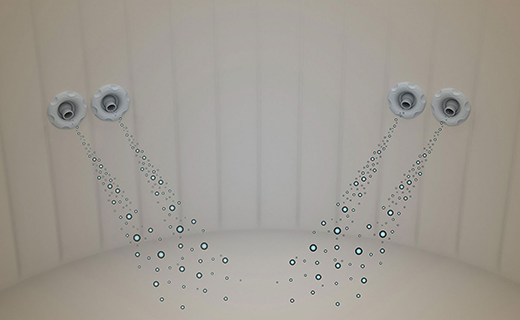 The drain system allows you to change and empty your water without deflating the spa. So, if you plan to not enjoy your hot tub during the winter months, you can quickly empty all water without the trouble of inflating and deflating the spa. Are you curious about the filter system? Lay-Z-Spa built the filter to the inside of the Palm Springs spa. So, you will have no problems cleaning your hot tub. Here is where this cleaning system sets itself apart from others on our list—the Clearsoft water treatment system. This eliminates hard water within your spa. So, only smooth water touches your skin. You will feel safe and clean while relaxing in your hot tub. You only need to add salt and water to the system—that’s it. This spa ships with all the inflatable hot tub essentials. You will find a chemical floater to keep your water clean, a setup DVD, a repair patch kit for any holes, and two filter cartridges. 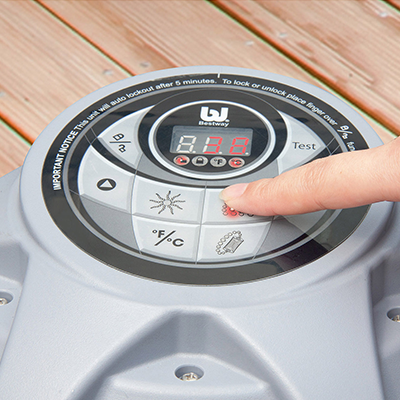 For insulating your hot tub, you will find a ground mat and an inflatable lid in the box. 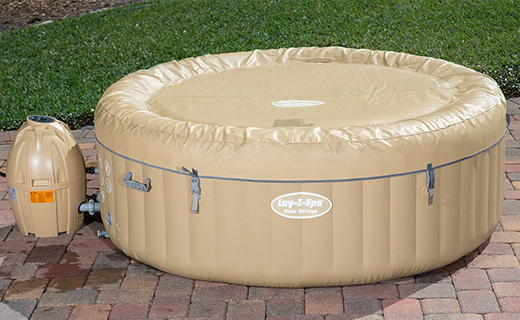 The Lay-Z-Spa Palm Springs ships with a one-year warranty. Hydrojets give a great massage. Clearsoft water treatment system included. No chemical kit included—you must buy one separately. The Lay-Z-Spa Palm Springs offers a great hot tub experience. Think of it as a basic spa with some luxury features. The hydrojets offer the ultimate soothing experience. Meanwhile, the pool feels neither too large nor too small. However, you will need to spend some extra money on a chemical kit. Also, the lower water capacity might not feel great for everyone. Have you ever wanted a massive hot tub without the massive hit to your wallet? Intex provides a solution in the form of it’s Pure Spa 6-Person hot tub. This large spa offers all the essentials of an inflatable hot tube. But does it stand out in any other way than its size? Continue reading to find out! We already mentioned this spa is huge. No one can deny that. At 216cm x 216cm x 71cm, you will comfortably fit 6 friends in this hot tub. Even better, this spa’s capacity reaches 1097 L of water. Again, if we have not yet made the point clear, this spa is big. Intex employs the work of 140 bubble airjets. These bubbles feel comfortable when relaxing in this spa. You will not feel as great of a massage as other spas on the market. Yet we cannot deny that these bubbles soothed us into relaxation. Feel the troubles of any long day relax away with these bubbles. As you would expect from an inflatable hot tub, Intex’s heater reaches 40 degrees Celsius. Of course, you can also adjust the temperature to your liking with the control panel. To save energy and money, you will not use your heater at all times. For these moments, the inflatable lid, cover, and ground mat will insulate your spa and retain most heat. Sadly, not all is great with the heater. During setup, this spa took upwards of 12 hours to heat. If you live in a cold climate, expect a longer wait time. Of all the spas on our list, this hot tub requires to most time to reach desired temperatures. As with other inflatable hot tubs, the setup process feels easy. You simply place the mat beneath the spa, inflate the hot tub, and you’re done. If the pump fills confusing, you can refer to the included setup DVD. Speaking of easy, the control panel never feels too difficult. You can view the temperature of your spa. The panel also allows you to adjust the temperature and bubbles. You can also toggle between Celsius and Fahrenheit displays. Keep in mind that you can place this spa outside in 4 degree Celsius weather. Anything below will freeze the water. Thus, this is not the best winter spa on the market. Do you want an easy to clean hot tub? Of course, you do! and thankfully, Intex provides some great filters. The spa ships with two filters. You can easily and cheaply replace these filters after they expire. You will also find a floating chlorine dispenser to keep your water clean. If you ever need to check your water, you can apply the included test strips. These will display your water’s ph levels and chlorine levels. Here is where this deal becomes even better. Intex includes a built-n hard water system. Your water will flow steadily as the filter eliminates hard water. This works from the system creating an electromagnetic field to remove calcium and other minerals in the water. This step suspends these mineral crystals. The filter cartridge traps the remaining crystals. Thus only soft water remains in your spa. The Intex spa ships with all the inflatable hot tub essentials. You will receive your insulated cover and ground cloth for retaining heat. You will also find your heating, filtration, air blower, and hard water system inside the box. The spa also ships with two filter cartridges, an inflatable hose, a carry bag, a floating chlorine dispenser, and 3-way test strips. Sturdy sidewalls—enough to even sit on them. Complete package with many accessories for a low price. Long time to heat water—expect upwards of 12 hours—even more in cold climate. Difficult to retain heat in colder climates. Inflatable headrests are not great for shorter people. 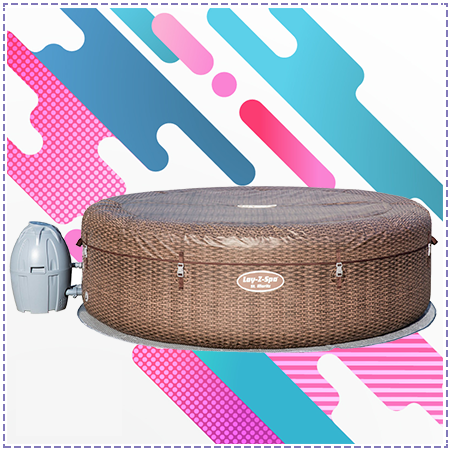 If you are searching for an inflatable spa with a great size, filter, and price, then look no further than this Intex model. You will find all your hot tub essentials in this package. You will find some annoyances with the heater. But at the end of the day, the Intex Inflatable Pure Spa 6-Person hot tub works as a great deal. Are you looking for a budget-friendly inflatable hot tub? Lay-Z-Spa’s Hawaii model offers you all the essentials at a low price. Are these essentials enough to stand out amongst the bells and whistles of the other spas on our list? Read our review to find out! So, seeing as this is one of the cheaper spas on our list, it must be lacking in size, right? Wrong! At 180cm x 180cm x 71cm, this spa ranks in the larger half of the market’s inflatable hot tubs. Add to that the 840 L of water capacity, and you can fit 4-6 friends in this spa. The space feels so comfortable that none of your friends will even know you bought this at a cheaper price than the typical inflatable hot tub. You will want that nice soothing feel when you step into your hot tub. Thankfully, the bubbles from these 120 airjets will perform that exact job. You might not feel the same massage or pressure from hydrojets. But this does not mean the airjets accomplish nothing. Instead, these airjets emit enough bubbles to provide a nice relaxing finish to any long day. Much like all other spas on our list, the Lay-Z-Spa Hawaii will reach 40 degrees Celsius. A soft touch control panel will allow you to toggle between Fahrenheit and Celsius displays. Of course, you can also adjust the temperature to meet your relaxation needs. This spa comes with the dual heating system found in other Lay-Z-Spa models. This sounds like a great system. Sadly, expect some disappointment. Heating a new tub of water required 12 hours during our tests. We noticed the hot tub only heated 1-2 degrees an hour. This feels long when compared to other spas. So, expect to wait a full day before jumping in your new spa. On the bright side, the Hawaii model comes with an energy saving timer. This powers off your heater when not in use. Even better, you can time your pool to heat up for specific times of day. So, if you want to spend some time in your spa immediately after work, you can set a timer so that warm soothing water will be waiting for you. When it comes to insulation, you will also receive a durable leatheroid lid. The lid attaches to the hot tub through double lock safety clips. On top of this, you will receive a cover and an air pad floor mat. So, you will not only feel a cushioned floor on your spa, but heat will not escape through the bottom. Speaking of durability, Lay-Z-Spa built this hot tub with some of the market’s sturdiest materials. The TriTech material and I-Beam construction offer a comfortable relaxation surface. But the fun does not stop at comfort. The three layer TriTech material prevents any flexing or bending when leaning on the spa’s walls. Even better, twigs and rocks will not scratch or puncture this material. Keep in mind that this spa comes with a leatheroid inflatable lid. You will need to try to puncture this material before piercing through its hefty texture. By this point, we all know we need clean water for these spas. Thankfully, the two filter cartridges keep the water sanitary for all your friends to enjoy. However, we recommend buying some extra chemicals to fully cleanse your spa. 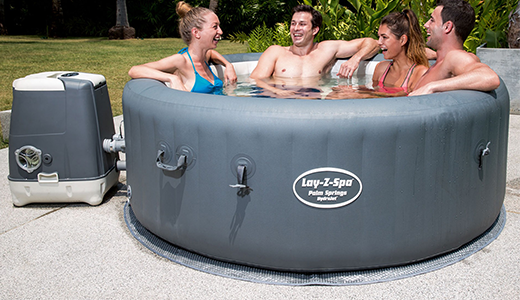 The Lay-Z-Spa Hawaii ships with all the basics you will need for an inflatable hot tub. You will find a DVD to clarify any questions with setting up your spa. You will also find a filter cartridge and a chemical floater for clean water. For heat, you will receive a bubble mat and a digitally controlled water heater. Filter/ pump controls filter, heat, chlorine, and bubbles. Water heater is on the slower side. The heater will NOT work alongside jets. Inflatable hot tubs at a budget price seem like a rarity. However, we recommend giving the Lay-Z-Spa Hawaii a chance. The package might not come with flashy LED lights or high-pressure Hydrojets. However, you will find this spa performs the essential spa functions at an exceptional rate. While a luxury feature, hydrojets do not work for everyone. Perhaps you want to save some money by omitting the hydrojets. Or maybe you just don’t prefer the pressure they provide. Whatever your reasons, the Palm Springs model comes in an airjet variant. But, will the Palmsprings airjet perform as well as its hydrojet counterpart? Read along to learn more. At 196cm x 196cm x 71cm, this spa ranks on par with its hydrojet counterpart. 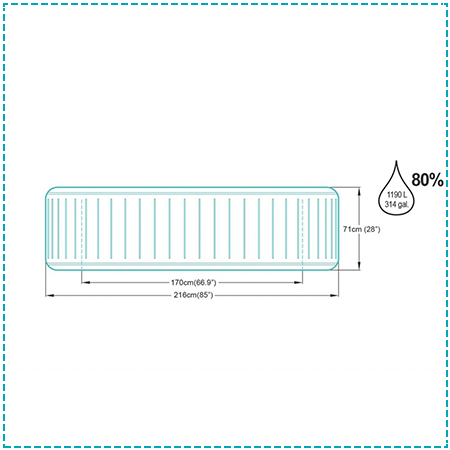 Interestingly, you will receive a much larger capacity at 963 L of water. This actually fixes one of the issues of the hydrojet model, as we felt its capacity seemed pretty low. You can fit between four to six other people in this spa. So, this will work great for those gatherings with family and friends. As with other spas on our list, the heater reaches a maximum temperature of 40 degrees Celsius. Of course, you can adjust the heat to meet your comfort needs. Much like other Lay-Z-Spa products, you will find an energy saving timer on the Palm Springs Airjet. This is great since the heater switches off when not in use. Even better, you can schedule the heater to activate at specific times. So, you can plan ahead instead of spending excess money on a heater constantly running. Sadly, the dual heating system does not heat the water at a fast rate. During our tests, we counted 1-2 degrees per hour. After setup, we waited about eight hours before the water heated to a decent temperature. This felt a bit lengthy. Yet we also tested hot tubs with far longer wait times. Are you worried about your spa losing heat when the heater is powered off? Then you will be happy to learn this spa ships with an inflatable lid and a soft mat to prevent heat from escaping. Unfortunately, the heater will not work simultaneously with the Jets. So on cold nights, expect the spa to lose heat quickly. Obviously, this spa comes with a variety of energy saving options. We calculated we would only spend £10 a month to operate this hot tub. Of course, this number highly depends on usage habits. Much like the hydrojet model, the Palm Springs Airjet offers Lay-Z-Spa’s I-beam technology. This means you can physically sit on the spa’s walls without any bending or flexing. In fact, our tests found this material to offer more durability than the leatheroid spas. 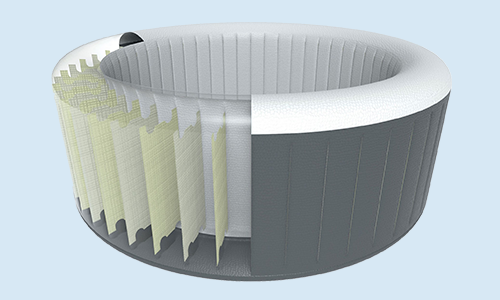 Lay-Z-Spa crafts this hot tub from its TriTech 3 material. This means you receive a well reinforced material from polyester and PVC. This material is not just durable. The cushioned air pad floor adds some nice comfort when relaxing in this spa. This air pad floor rests beneath the spa. This reduces heat loss through the hot tub’s bottom. Here’s where the problem begins. The brown colour will not appeal to everyone. On patios, the colour stands out in a bad way. On the bright side, the brown blends nicely with grass when placed in outdoor gardens. Also, the inner white colour appears much appealing. Are you a fan of hot tub bubbles? Then you will not want to miss this spa’s 120 airjets. These jets produce bubbles from the perimeter of the hot tub’s floor. These offer that perfect soothing feel after a long day. The filters in this spa are easy to use. The filter fits inside the pool. You will also apply a chemical floater inside the hot tub for clean water. The last thing you want with a hot tub is for your guests to become disgusted with the water content. Thankfully, these filters keep the water at sanitary levels. Unfortunately, you will need to purchase a separate chemical kit. The Lay-Z-Spa Palm Springs Airjet model comes with a one-year warranty. One of the bigger options on our list. Must purchase chemical kit separately. Color is not for everyone. Are you searching for a slight alternative to the Lay-Z-Spa Palm Springs Hydrojet? The airjet model offers more than just a difference in jet type. You will also receive more water capacity. If you can bear the gaudy brown colour, the Palm Springs Airjet might be the inflatable hot tub for you. Do you want an inflatable hot tub outside the Lay-Z-Spa line? If the Intex 6-person spa seems too big for your needs, then take a look at Intex’s Octagonal Pure Spa 4 person. This spa will provide you with all you could ever want from an inflatable hot tub. But is that enough to help this spa standout amongst the stellar Lay-Z-Spa models? After reading along, we’ll allow you to form your own choice. At 201cm x 201cm x 71cm, you will find this spa to rank as a decent size. On the other hand, the water capacity feels low at 795 litres of water. Still you can comfortably fit four people in this spa. So, this will work great for families and smaller gatherings. If you want that massaging feel, check out the 120 bubble jets in this spa. The hot tub offers its patented Fiber-Tech construction PureSpa bubble therapy. Really, this is just a fancy term for an airjet. How do these jets perform? You will feel that same soothing feeling offered by other airjets. They will not provide the same pressure of hydrojets. Nonetheless, these 120 bubble jets offer a relaxing experience. Intex’s heater works similar to other heaters on our list. You can reach a maximum temperature of 40 degrees Celsius. You can also adjust to lower temperatures if you find them more comfortable. The control panel for changing the temperature feels simple enough. You will find six present buttons. The images appear clear enough to know what each button does. For example, the up button raises the water’s heat. The down button lowers the heat. C/F will toggle between Celsius and Fahrenheit displays. Meanwhile, the button with bubbles turns the airjets on and off. As far as heating your water goes, expect the temperature to rise between 1.5-2.5 degrees C an hour. This heater works faster than others on our list. In fact, you can expect the water fully heated in as short as seven hours. Of course, this does require warm weather and initially warm water. So, the pool heats water quickly. Sadly, the pool does not retain the heat well. Yes, you do receive the typical floor mat, inflatable lid, and lid cover. However, the lid did have a habit of leaking air. This allows quite a bit of heat to escape the spa, which means you will be reheating quite often. Even worse, when this problem begins, the best solution involves buying a new inflatable lid. On the bright side, you will find locking buckles on the lid. These secure the top nicely to the spa. Even in harsh weather, the buckles never lost their grip. Much like other inflatable hot tub filters, you will use filter cartridges to clean your water. The spa will provide you with two. If you ever need more, you can buy them for a low price online and at specialty retailers. Even better, replacing these cartridges is an easy task. Thus, you can keep your water clean with little effort. Intex crafts its spas from laminated PVC. The material is a puncture resistant, 3-ply laminated material. Our tests found this material to feel sturdy. Basic rocks and twigs never produced any holes or scratches. Fiber-Tech technology coats the walls of this spa. The term sounds complicated. But here’s the bottom line—this technology gives the hot tub some great stability. You can lean on the walls without the material ripping or deflating. So, you can relax without worrying about harming your inflatable spa. This spa ships with all the basics you would expect. A control base, control panel, spa cover, control inlet, drain plug, and valves ensure you will need no outside tools for assembly. You will also find two filter cartridges, a spa cover, a ground cloth, test strips, pressure gauge, a spa filter motor, and a deflation hose adapter for all other essential functions. This package also comes with two standout features. The first includes the bubble pad. This creates a comfortable cushion when sitting in your hot tub. If you opt for something more luxurious, you can always purchase actual seats for a decent price. The spa also provides a carry bag. This is a great feature if you ever need to move your spa to a new home or location. We also found the bag makes for great storage during months where you will not use your hot tub. The Intex Octagonal Pure Spa comes with a one-year warranty. Carry bag is nice for storage and portability. Lid has a habit of losing air. 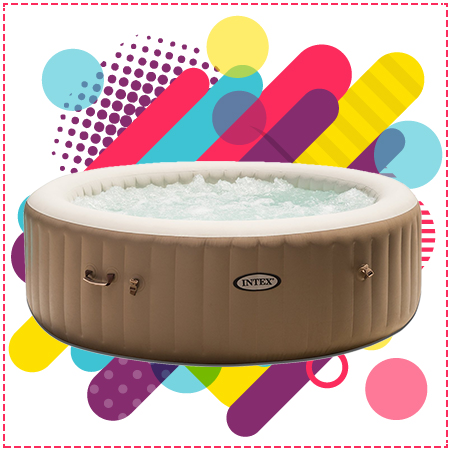 The Intex Octagonal Pure Spa 4-Person Bubble Therapy Hot Tub offers a solid alternative to the Lay-Z-Spa hot tubs. The size is great for smaller gatherings, while the heater actually heats the water in decent time. You might notice the lid loses air on occasion. But this is not a problem for everyone. If you are one of these people, then this inflatable hot tub might cover all your needs. Admit it. Flashy LED lights look cool. Even if they fail to improve the functions of the spa, they add a nice sense of life to the pool. And this is just what you will find with the Lay-Z-Spa St. Tropez. Create the life of the party with this pool’s LED features! Of course, the fun does not end with the lights. Read along to see what other tricks this inflatable hot tub performs! At 196cm x 196cm x 58cm, this pool is decent sized. Add to this that you can fit 848 L of water in this spa, and you are looking at a hot tub that will fit six people. This means you can use this pool for gatherings with friends and family. Much like other Lay-Z-Spa hot tubs, the St. Tropez offers a dual operated heating system. This will allow you to reach a maximum temperature of 40 degrees C.
Of course, the dual heating system heats at a rate of 1.5-2 degrees Celsius an hour. This rate felt slow in the pool, as you will need to wait about 8 hours to reach the maximum temperature. 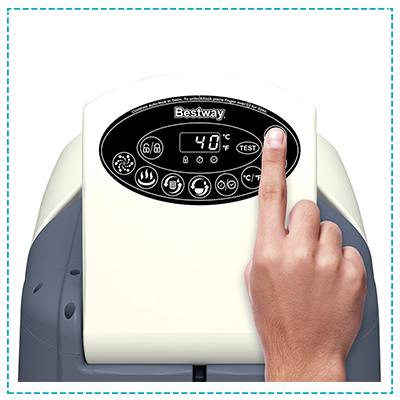 As with other Lay-Z-Spa heaters, the energy saving timer helps the above issue. If you plan ahead, you can set the timer to reach a target heat by a desired time. So, if you want to come home from work to a soothing spa, you can set a timer so the water will be ready for you to jump right in. You can plan the timer for 72 hours in advance. Here is where this hot tub stands out amongst others on the market. The heater works alongside the air pump. 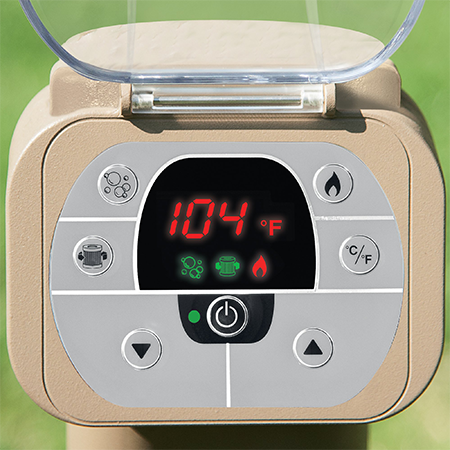 This means you can enjoy the massaging air bubbles, heat your spa, and filter your water all at the same time. The St. Tropez offers 87 airjets. These jets provide a soothing bubble experience. Yet 87 jets seem like a small amount for a spa of this size. We felt a slight difference between this spa and hot tubs with 120 airjets. But we will admit the 87 airjets still offered a relaxing feel. Who wants an eyesore of a hot tub sitting in their yard. Thankfully, this blue spa is appealing to the eyes. Lay-Z-Spa crafted the walls with its TriTech material. This will allow you to lean against the sides of the pool without any flexing or bending. But you might be wondering, “ how does this spa separate itself from the others?” The answer involves a floating LED light. This waterproof bulb floats around your hot tub. You can select from four colors to set the mood for any situation. Select from romantic reds to soothing blues. Either way you look at it, this spa will standout at any gathering. By now, we do not expect much difficulty in setting up an inflatable spa. Thankfully, the St. Tropez follows suit. The hot tub ships with its own pump to inflate the spa. Thus, you will not need any outside tools. If you need any help, you can always watch the included DVD for clarity. The hot tub fits on any flat surface. Thus, you can select anywhere on your deck or in a ventilated room in your home. The setup only takes about 10 minutes. Filling with water only adds 1-2 hours. The Saint Tropez model ships with everything you will need to maintain your spa. These include a DVD guide, a chemical floater, a spa pump, a bubble mat, a side and leatheroid cover, a soft insulated floor, a soft-touch control panel, a repair kit, and two filter cartridges. The St. Tropez ships with an extendable one-year warranty. Good price when considering all features. Few airjets for its size. LED light is not attached to pool. Are you looking for that extra cosmetic touch for your inflatable hot tub? For those who answer yes, the St. Tropez will cover all your needs. In fact, we really struggled to find any problems considering the price of this spa. The spa’s performance ranked on par with all other hot tubs on our list. At the same time, none of the features far exceeded those of other spas on our lists. But this is not necessarily a bad thing. So, we can all admit LED lights are cool, right? Yet not all of us like the thought of a bulb floating all over our hot tub. This is where the Lay-Z-Spa Paris hot tub saves the day. Here, you receive all the fun of LED lights. However, these lights fit into the sides of the spa. Of course, you can also expect all your hot tub essentials in this spa as well. So, let’s take a deeper look at all of this hot tub’s fun features. 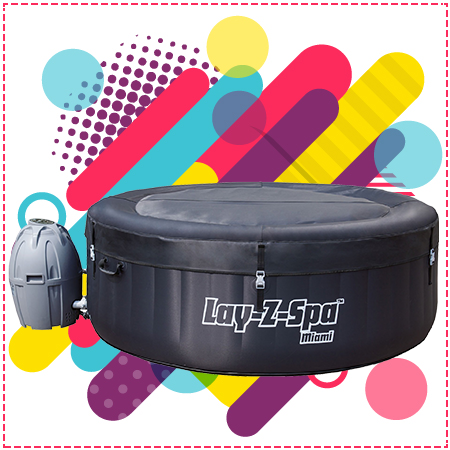 The Lay-Z-Spa Paris measures to 196cm x 196cm x 66cm. The spa offers a deep capacity of 945L as well. These measurements will allow 4-6 people to fit in this hot tub comfortably. This is great news for people who host gatherings with family and friends. Much like the Lay-Z-Spa St. Tropez, the Paris model offers few airjets for its size. Yet, the 87 airjets produce enough bubbles to create a soothing experience. Think of the feeling as a mini-massage. These jets might lack the power of a hydrojet. Yet the bubbles will relax any achy muscles or pains. Perhaps the best feature of the airjets is the fact you can use them alongside your heater. This means the pump will blow bubbles while heating your pool. As with all other heaters on our list, the Paris model reaches 40 degrees Celsius. And yes, you can adjust the temperature with the control panel. Sadly, the dual heating system is on the slower side. You can expect 10 hours to fully heat your hot tub. However, once heated, the water maintains its heat pretty well. To counter this, the spa comes with an energy saving timer. This allows the hot tub to set a specific heat for a specific moment. In fact, the timer works 72 hours in advance. So, you can set your timer to heat your spa for any upcoming event. Are you curious how this spa retains its heat? The answer involves an inflatable lid. The leatheroid cover prevents scratches and punctures. This means you do not need to prepare for any holes or air leaks. More insulation comes from the floor mat under the spa. This piece prevents heat from escaping the bottom of the hot tub. At the same time, you might enjoy the pads comfortable cushioning. Here’s the deal: We all like durability in our inflatable hot tubs. Lay-Z-Spa’s I-Beam construction provides just enough to ensure the Paris model lasts years. You can lean against the walls without the material bending or tearing. Even better, the walls feel cushiony as well. The construction of the spa is nice. But here is where the real fun begins—LED lights! These lights offer seven different colours. This allows a mood for anything. So, choose from soothing blues, to romantic reds, to vibrant pinks. You will need some extra assembly, but the fun is well worth the effort. You will cycle through the colours with a waterproof remote. Sadly, this device works separately from the control panel. So it will not also control the temperature and airjets. 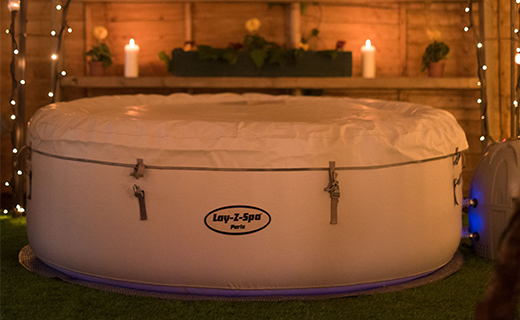 Much like other spas on our list, the Lay-Z-Spa Paris inflates in 10 minutes. You will need no outside tools. Even better, the spa comes with a seven-metre lead. This cord will plug into any standard UK 13 AMP outlet. Even maintenance is nothing difficult in this spa. Just remember to perform a water change every four weeks. That’s it! The rest simply involves replacing filter cartridges and adding any outside chemicals if you desire. The Lay-Z-Spa Paris ships with all the essentials you will ever need. This includes a digital heater pump with water filtration and airjet system. You can also expect the cushioned floor mat, cover, and lid for insulation. For cleaning, you will receive two Bestway Lay-Z-Spa filter cartridges and one Bestway Lay-Z-Spa Chemical floater. For setup, you can expect a DVD, repair patches, and a ground cover. And no, Lay-Z-Spa did not leave out the fun part of this hot tub. So, you will also find a wireless LED remote and lighting system in the package. The Lay-Z-Spa Paris ships with a 12 month warranty on the pump. Meanwhile, you will receive a six-month warranty on the liner. You can extend the warranty by registering the product. So, we definitely recommend spending a few minutes to do so. Lights add a cool and fun effect. One of the larger spas. Remote and control panel control separate functions. Lengthy heating time—especially for a rapid heating system. 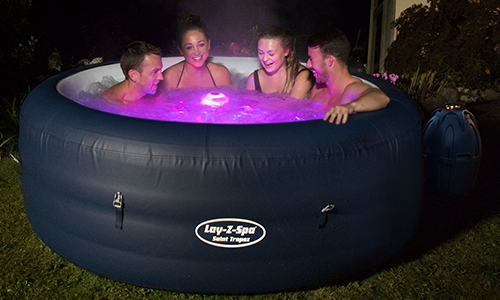 If you’re searching for a hot tub that will add some life to any party, the Lay-Z-Spa Paris is the choice for you! The lights set the mood for any moment. Of course, Lay-Z-Spa did not neglect functions either. Once you get past the lengthy heat times, you will find the filters and design to bring you all you will ever need in an inflatable hot tub. Do you need your inflatable hot tub to come with some durability? 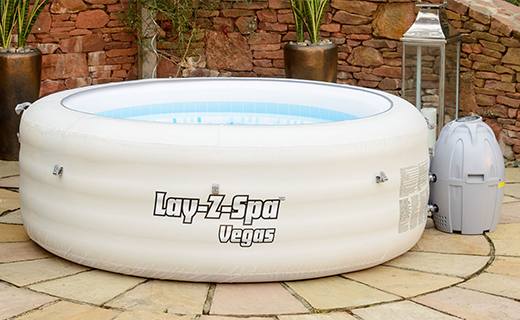 Lay-Z-Spa’s Vegas model offers some of the sturdiest options you will find on the market. To top off this sweet deal, you will find exceptional features all around. So read along, and learn why you won’t need a Las Vegas suite to experience this type of luxury. The Lay-Z-Spa Las Vegas Hot tub acts as one of the larger options on our list. At 196cm x 196cm x 61 cm, this spa will occupy a decent amount of space. Combine this with a capacity of 848 L, and you’re looking at a hot tub that will fit 4-6 people. By now, you’re probably expecting this heater to reach a maximum of 40 degrees Celsius. And you are 100% right! Of course, if you want a lower temperature, you can adjust the heat to meet your needs. Overall, the heater will help you achieve the ultimate comfort. Our only gripe involves how the heater will not work at the same time as the bubbler. As with other Lay-Z-Spas, the Vegas comes with an energy saving timer. This means your spa’s heater shuts off when not in use. You can also set a timer for the water to reach set temperatures at specific times. The energy saving options will help your electric bill. During winter months, we only spent £10 a month. Of course, this number depends on your own usage and location. Most of us will want more than heat for that soothing feel. To, help, this spa offers 87 airjets. These produce bubbles to ease any aches and pains. These airjets lack the same power as hydrojets. Yet, they still perform their job well. During our tests, we found them to be a welcome addition to the spa. Remember earlier when we mentioned this spa is durable. We meant it. Across the surface, you will find Lay-Z-Spa’s leatheroid material. This offers scratch resistance, puncture resistance, and impact resistance to any surface. You will find the leathroid material covering the lid, and covers. These are critical locations, as the lid keeps your pool insulated. Most of us will want a sturdy hot tub frame as well. 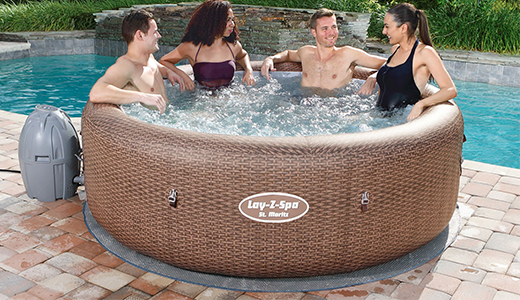 Thankfully, Lay-Z-Spa constructed the spa’s body with its Quad Horizontal Ring technology. This allows the inflatable hot tub to feel like a fixed spa. During our tests, we agree. The walls felt so sturdy that we forgot they inflated. We noticed no bending or flexing in the spa’s frame when leaning against its walls. Don’t think that durable and sleekness cannot exist in the same world. The mosaic-print interior looks great inside this spa. The spa ships with everything you will need for set up and maintenance. So, expect the heater pump with water filtration and airjet system to ship with your hot tub. Also, you will find the cushioned floor, leatheroid cover, and lid for insulation. You will also need to clean your inflatable hot tub. To help, Lay-Z-Spa includes two Bestway Lay-Z-Spa filter cartridges and one Bestway Lay-Z-Spa chemical floater. The cartridges are easy to replace. Meanwhile, the floater will keep your hot tub free of contaminants. Lastly, the spa ships with a DVD to help with any setup needs. You will also find some repair patches in the box if any mild tears occur. 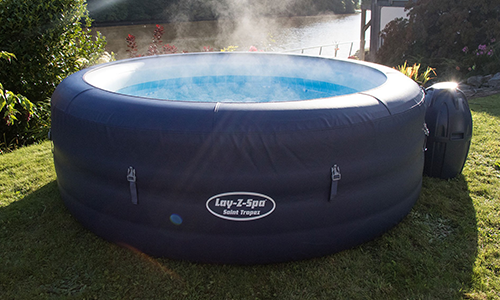 The Lay-Z-Spa Vegas ships with an extendable one-year warranty. No simultaneous bubbles and heat. Are you trying to find an affordable inflatable hot tub with all the basics? This Lay-Z-Spa Vegas performs on par with other spas on our list. At the same time, you will find some great durability at a low price. 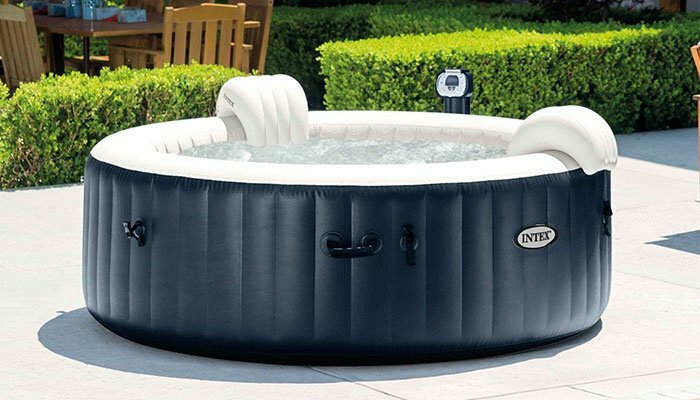 While you might not find any standout features, this spa will provide you with all the essentials you could ever need in an inflatable hot tub. Let’s be honest. Do we all really need a pool to fit six people? For couples and small families, a small spa works perfectly fine. And this is where the Lay-Z-Spa Miami shines. It might not present itself as the largest hot tub on our list. But some of us lack the space to house a large pool. In this case, the Lay-Z-Spa Miami acts as one of the best options when it comes to downsizing. This is where the Lay-Z-Spa Miami stands out among the other hot tubs on our list. At 180 cm x 180cm x 65 cm, this spa requires less space than others. Add to this the 800 L capacity, and you have a spa that will fit 2-4 people. Really, this is not a bad thing. In fact this size is perfect for couples who do not host many parties or gatherings. If you want a heater that operates on par with other inflatable spas, you will find it with the Miami model. You will reach a maximum temperature of 40 degrees Celsius. As with other spas, you can adjust the heat to fit within your comfort zone. The only problem we noticed with the heater included the heating time. We waited a full ten hours to heat the spa. This is a lengthy amount of wait time, especially for a hot tub of this size. To compensate, the energy saving timer is a nice addition. Much like other Lay-Z-Spas, this feature powers off the heater when not in use. You can also set timers to ensure the pool heats when you want. This is perfect for jumping in your hot tub after a long day of work. A small size does not mean you lose any luxury features. The Lay-Z-Spa Miami provides 81 airjets. This will provide just enough bubbles for that nice, soothing feel. Any aches and pains will receive relief with these airjets. Visually, the hot tub looks stylish. The black and white colours look sleek wherever you place this spa. Meanwhile, the internal blue is soothing for the eyes. As we all know, a great spa offers more than a cosmetic experience. Thankfully, the Lay-Z-Spa Miami offers a durable body. You will find Lay-Z-Spa’s I-Beam technology along this hot tub’s frame. These beams offer some great stability. In fact, you can lean against the wall without feeling any form of sinking or bending. To be exact, you receive 48 vertical I-Beams in this hot tub. Remember that the rayon coated outer walls are puncture resistant. Here’s the best part. All this durability does not come at the cost of reduced comfort. So, you get a comfortable, cushioned wall surface with sturdy walls. At the end fo the day, this makes for a relaxing hot tub experience. Despite its small size, you can expect all hot tub essentials to ship with your Lay-Z-Spa Miami. 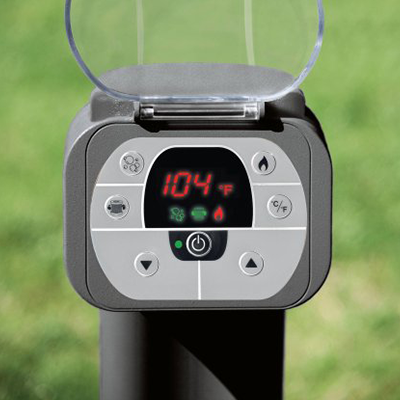 You will find a digital heater pump with water filtration and airjet systems to operate your spa. 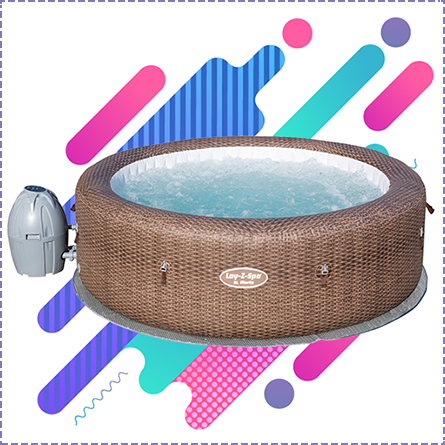 For insulation, the hot tub ships with a Rayon coated inflatable top and a soft cushioned floor.bFor cleaning your spa, you will find two Bestway filter cartridges. The hot tub also ships with a Bestway chemical floater for sanitizing your spa. Lastly, the hot tub arrives with a setup DVD to help with installation. Should you ever find rips or tears in your spa, you will be happy the hot tub also comes with repair patches. Small size works for couples and small families. Also great for smaller spaces. Takes a while to heat 10+ hours. Pump does not heat the water when in use. Are you a person who doesn’t need the largest spa on the market? The Lay-Z-Spa Miami teaches that great things can come in small packages. For everything this hot tub lacks in size, it compensates in performance. If you can get past the lengthy heat up times, this spa works great for couples and small families. Which Inflatable Hot Tub is Best? Now for the answer, we have all been wanting! The best inflatable hot tub will vary based on your needs, wants, and budget. For the most part, all 10 of these spas serve a purpose of some type. So, keep in mind that the right inflatable hot tub does exist for you. If we are talking about the best overall spa, the Lay-Z-Spa Palm Spring Hydrojet offers the best experience. Nothing can compare to the massaging features of those hydrojets. To top this off, who could argue with a hard water treatment system? With this hot tub, you receive a spa that provides you with the best quality of water possible. Your skin and body will not only feel great, but your hot tub will last longer. Of course, not all of us can afford the top model on the market. For those looking for the best value for their pounds, then check out the Lay-Z-Spa Saint Tropez and the Lay-Z-Spa Palm Springs airjets. The Saint Tropez performs exceptional in all areas. The package becomes even better with the LED lights. Who could argue with an extra sense of fun in their spa? Of course the Lay-Z-Spa Palm Springs airjet offers all the benefits of its hydrojet counterpart. The only noticeable difference here includes the lack of hydrojets. For many, the airjets will suffice. You will still feel some relief to your aches and pains. Plus, those bubbles add a soothing end to any rough day! Sometimes, you might want the market’s cheapest product. For this, we recommend the Lazy-Spa Hawaii offers your best deal for less than £500. Here you receive all the essentials—a decent heater, a sturdy build, airjets, and fast setup. Really, where can you go wrong with saving money here? Even after reading our reviews, you may still have some questions. Here we provided a list of the most common questions we receive about inflatable hot tubs. Along the way, we provide some answer to ease any concerns. Are inflatable hot tubs expensive to run? Many factors play into this answer. Some spas will come with energy saving timers to reduce any costs. Though depending on usage, many first-time users will spend £7 a week. With less usage, you can reduce your charges to a very affordable £10 a month. Remember to use your top covers, inflatable lids, and floor mats to insulate your tub. This prevents heat from escaping, which means you use less power from your heater. Can inflatable hot tubs be used in the winter? For many spas, the answer is yes. Sometimes you will find thermal blankets to further insulate your hot tub. Just remember that your heating costs will rise in the winter as a result of the colder weather. Also, avoid using your spa when the temperature drops below 4-5°C. Can I use the spa indoors? You can use your spa indoors. You will need to place the hot tub in a ventilated room. Also, remember to measure your doors and entry ways—this will ensure your spa fits into desired room. You will also need to check surrounding outlets. Make sure they provide the right amount of voltage. Also, remember that most cords extend to seven metres. This means you will need to place your spa within seven metres of an outlet. How durable are inflatable hot tubs? The answer varies by model. Some offer walls sturdy enough to sit atop. Other spas offer puncture-proof and scratch proof material. This will protect against branches, cats, etc. Be aware of materials crafted from vinyl. They offer a thickness of 30-50 mm, which is not good for deep punctures. It will withstand pokes and scratches, however. Are inflatable hot tubs noisy? Most people will answer no. The only loud part of owning an inflatable hot tub is the inflating process. You might notice airjets and bubblers produce a low humming noise. Yet this is nothing louder than an air conditioning unit. The splashing water emits some noise. Really though, this sounds pretty charming when trying to relax. Do you need an air pump to blow it up? Most of these spas do need an air pump. 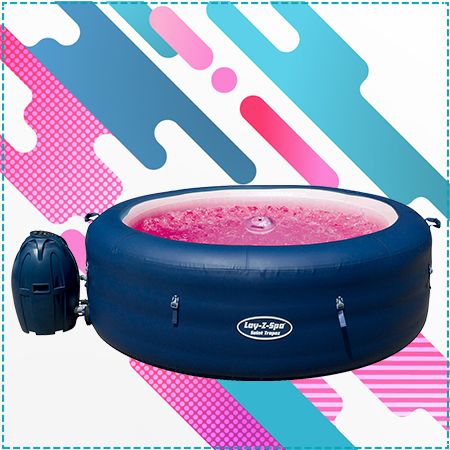 Note that most inflatable hot tubs ship with a pump. Others require electric air pumps. We all like to relax after a long day’s work. Hot tubs offer the perfect solution to sooth away the day’s troubles. Even better, these spas work great for small gatherings with friends. So, what’s not to love? Inflatable hot tubs offer a unique twist to the classic hot tub. After reading our reviews we hope you learned these spas work just as well as traditional fixed hot tubs. More than that, we hope you found the inflatable hot tub for you. Remember, an inflatable hot tub exists for your needs. So assess your options, and pick the spa for you! Inflatable hot tubs might cost a hefty sum of money. But you will find the decision is worthwhile once you’ve relaxed in a pool of bubbles or hydrojets.